Reflections of a Grady Doctor: This makes me cry. I called my dad in California the other day and simply said, "Dad? I need you. I need your influence and your help and your everything today. And I really wish you lived here. Today, I really, really do." And then I got off of the phone because I had a meeting and didn't want to start crying. He said a few words back to me and let me go. No. There was no catastrophe. Not at all. It was just one of those days. I just wished that he could be sitting at the kitchen table with Isaiah like he did with me way back when. See, my dad and my mom? They are just hard-wired for making kids feel good about themselves. Particularly when it comes to school. Mom is just north of Atlanta, so we get her influence abundantly and often. But when combined with Papa? It's the one-two punch. I think I'm a good mother. I do. I love my kids and love my husband and work hard to let them know each day how cherished they are. But mothering isn't always a cake walk and I am coming to deeply respect all that my parents did with the four of us. All that they poured into making us hard workers and bright, inquisitive human beings. It isn't always easy. Or intuitive. I'm seeing that first hand. On that day, I just wished I could have my Dad's influence. The man in him, the wisdom in him . . . the deep of his voice and that special thing God equipped him with for dealing with children. No, not just the influence that trickles over from me since I was raised by him . . . . but his daily influence on my child. You know? It's funny. There's something in my father's presence that makes kids want to work harder and sit up a little straighter. Firm but loving. Encouraging but expectant. I've not fully captured it in words, but this is probably one of the main reasons I send my children to California each summer to be with him. I'm fortunate to be married to a man who also values this. I want them to have a big dose of that presence while it is here. Because it meant everything to me. "I'm here." That's all Dad said. And then he got off of the phone. My friend Angella L. has a special knack for capturing ordinary yet special family moments in simple photographs. Ever since I met her, I've tried to do more of that. This picture was taken at my kitchen table this evening. 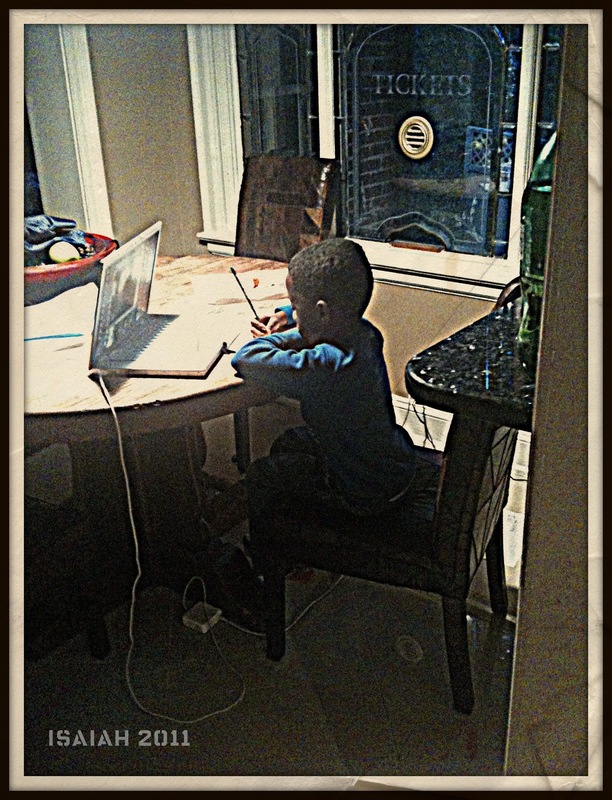 Isaiah and Papa practicing spelling words and math problems over Skype. Skype. Dad infusing that special ingredient of his into my manchild and my Isaiah sitting a little taller and working a little harder because of it. Exactly what I was wishing for. And it was Dad's idea. This? This image will make me cry for the rest of my life. One, because I know that parents don't live forever and two, because parents aren't always as "into" the grandparenting thing as this. I'm so thankful! I realize that this is a blessing. I so, so do. All of it. Having parents and grandparents and having them willing and able and selfless enough to participate in your life in such tangible ways. Mom volunteers once a week at the boys' school and does the same at the school my brother's children attend. And Dad? He does things like this. Look at this picture. This explains who I am. This is my mother. This is my father. This is my family. This is "I'm here." It is not enough to have something, if it is not cherished. And no matter how much you may cherish something, it cannot be a force in your life if you do not have it. But to have and to cherish... that may be the definition of happiness. May you always be happy. May you always have and cherish - your children, your husband, your parents, your siblings, the love of all who know you, the support of all whom you need, and so much more of the beauty and wonder and joy and kindness that the world has to offer. And this made me cry because without parents who gave you that message- you are kind, you are smart, you are important, it seems to me that it's almost possible to believe it no matter what. And grandparents can and should be part of that in a child's growing up. And I can do that. And I try. Thank-you. I do love your daddy, you know. I read this late last night and it moved me so. that picture of your sweet Isaiah, skyping with your dad (what a cool, with it dad! ), Isaiah so intent and committed, so clearly feeling valued and capable, sitting tall. And no wonder you are the woman you are, having been raised by parents such as you were blessed to have. And the fact that you know it while they are here, and can share it with your boys, i wish i could express how deeply happy for you this makes me. White Coat Dreamer said it beautifully. To have and to cherish. You do that. My own sweet son is 20 today and I know he would not be the solid human he is, the trier, the striver, so capable of loving, were it not for the men, his father and grandfathers, whom he was privileged to watch and emulate, and whose core goodness and integrity he challenges himself to live up to. Your family is beautiful. You have made it so. All of you. Wasn't even ready for this one! I'm a mess!!! I'd actually be willing to give him up to Atlanta for him to be closer to his grandchildren. Okay, I'm at work... I need to wipe my face! Kimberly, I remember when you were that little and I use to watch you guys and comb your hair. That was a beautiful blog and yes you are blessed to have your mom and dad to help instill some of the wonderful things they did for us as kids. Cherish them because they will not be with us forever and continue to be the awesome mother, young lady and doctor that you are. I'm so proud of you! In the book The Help, when Aibileen reflected on caring for the boy whose father tried to beat the "gay" out of him, it ripped at my heart. All kids just want to be valued, heard & loved. Your story reminds us all to do better, to be better & to value our kids, parents & grandparents. You are blessed. Your parents are awesome. I am honored by your words. And as much as I love my children, I find that love is multiplied exponentially in my grandchildren. We are all, indeed, blessed. Doc Cratchett!! You got me with this one! It truly takes a village...and I gotta say, the Drapers have got a helluva chief in our village!! Lurker/First timer poster & this just moved me to comment. You & your family are awesome ! Recognizing and acknowledging that you are blessed and then in turn being such a blessing to others....just amazing. It's no wonder you are the woman that you are. This is such a wonderful blog you have here. This post made me miss my own father in Atlanta. We just had a big fight, too, and we haven't spoken in more than a week. Sigh. Tears, from the beauty of the picture and from the message. And from the fact that my own father didn't live long enough to Skype his granddaughter. This is a beautiful tribute to your dad. He sounds like one hell of a guy.